Save time in the waiting room! If you are a new patient, please print and complete the New Patient Packet below before your appointment and bring the forms with you to your appointment. Our usual office hours are 8:30 a.m. until 5:00 p.m., Monday through Friday. Urgent problems can be seen at any time. Appointments may take between one-and-a-half to two hours or longer if special tests must be done. Eye drops to dilate the eyes are always used for a retinal examination. This may briefly blur your vision and make your eyes more sensitive to outdoor light. For these reasons, we ask that you plan not to drive and to bring sunglasses for the day of your appointment. We can also provide you with special sunglasses when your visit is over. Your initial office visit may include one or more of the following diagnostic imaging tests, which help your doctor tell you much as possible regarding your diagnosis and condition. Fundus photography: A digital camera is used to photograph portions of the retina for detailed examination or documentation. 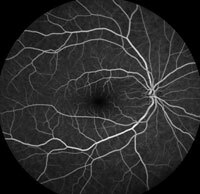 Fluorescein Angiography (FA): A fluorescent, vegetable-based dye is injected into a vein in your arm to study the circulation or patterns of blood flow in your retina. Optical coherence tomography (OCT): A rapid, painless test that provides very high-resolution images of the structure of the macula, or center of the retina. Ultrasonography: A test using sound waves to image the retina. 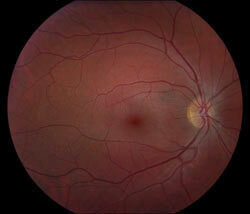 EyeSmart - Eye health information from the American Academy of Ophthalmology. Vista Center - Vista Center for the Blind and Visually Impaired empowers individuals who are blind or visually impaired to embrace life to the fullest.